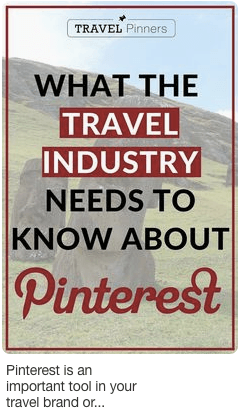 We may be biased because we work on the Pinterest platform all day, but it’s still shocking when we talk to travel industry professionals with active Pinterest accounts that have never heard of Rich Pins! It’s one of the basic necessities of any content-producing business on Pinterest and a crucial step in optimizing your account and making your Pinterest presence work for your brand. What is a Pinterest Rich Pin? See all those juicy details? Post title! Website where the article originated! Even the site’s favicon is there to tell us what we’re looking at and where it came from. This is a Rich Pin. The information you see is the metadata from the blog post that was automatically pulled by Pinterest, either when the pin was uploaded and assigned a URL, or just directly pinned by a reader who visited that blog post on the website where it lives. The bold title came from what was set as the SEO title in the Yoast SEO plugin’s settings; the description came from the information entered into the ‘alt tag’ field of the image’s metadata; the favicon and site name come from the website’s settings! Now we know that the link is verified as containing the information that the pin describes; not to mention that having this info makes the pin stand out and pinners are much more likely to click on it or repin it to a board where they can share the post with their followers. How Do I Get Rich Pins for My Pinterest Account? article Rich Pins. You can learn more about Rich Pins for recipes, products, places, movies or apps here but for our purposes we’ll be focusing on setting up article Rich Pins for the travel content on your blog or website. You’ll need to confirm your website with Pinterest first but assuming you’ve already done that, just follow these simple instructions for activating the article Rich Pins feature for your site. 1. Go to the “Social” section of your WordPress site’s SEO by Yoast plugin. 3. At the top of the settings page you’ll see “Add Open Graph metadata”. Select “Enabled“. It may already be set to this by default. Either way, hit “Save Changes” at the bottom just to be sure. 1. Log in to your Pinterest account if you haven’t already. 3. Enter the link to ANY blog post on your site. You don’t need to validate every single post, just one. A box will appear where you’ll have to enter your domain and select “HTML tags” as the data format (but it may already be checked by default). Hit the red “Apply Now” button. You should get a confirmation email within an hour. If for some reason you don’t get an email but you want to check that Rich Pins have been activated across your site, try pinning any image directly from a blog post and you’ll see if the pin on Pinterest is showing up as a Rich Pin now! Now You Have Rich Pins For Your Site’s Content Across Your Pinterest Account! As long as the backlinks on your pins are not connected to dead links or missing pages, all of your existing and future pins on Pinterest should appear in Rich Pin format. This will apply to any image you add to Pinterest (as long as you add a valid backlink) AND to images pinned directly from your site by your readers. Hello, user-generated content! This entire process should take less than five minutes of your time, and you should soon see an increase in clicks and repins. The Pinterest algorithm favors confirmed accounts with Rich Pins and they also stand out more and increase engagement. Let us know in the comments if you have seen the benefits from getting Rich Pins set up, and if you haven’t set them up yet, what are you waiting for?! Don’t forget to pin this post so that all your friends on Pinterest can set up Rich Pins too!